Nearly 9,000 members of Rotary from across the globe attended the Jubilee Audience at the Vatican in St. Peter's Square on 30 April 2016, at the invitation of Pope Francis. One of the fortunate group who participated in this Rotary International Audience with the Pope was Cranleigh Rotarian James Phiri, who was subsequently able to meet the Rotary International President, K. R. Ravindran. "It was a privilege to be amongst a group of people who have helped to achieve so much over years for a vast range of community activities," said James. "The devotion of the people I met to the moto of 'service above self ' was truly inspirational. It is amazing to feel totally amongst friends with shared values when you have only just met them. I suppose that is what Rotary does best." At the end of the Audience, a delegation of Rotary members - led by Rotary International President K.R. 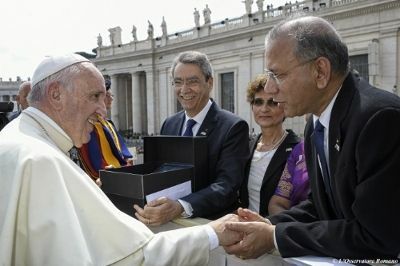 Ravindran - met Pope Francis, who urged Rotary to continue its leading role in the global programme of vaccinations against the deadly disease polio. "It is a tremendous honour to be part of this Jubilee Audience," said Ravindran. "Pope Francis has inspired men and women throughout the world - regardless of their faith - with his humble acts of kindness. His call to alleviate the root causes of extreme poverty and human suffering transcends religion, age, nationalism and politics. Rotary members from every religion, nation and creed share Pope Francis' spirit of mercy and compassion, which inspires us to act boldly to address the most difficult challenges facing our world today." Rotary and its partners in the Global Polio Eradication Initiative are on the brink of making global health history as polio is slated to become the second human disease ever to be eliminated. Cases of this paralysing disease have plummeted by more than 99.9 percent, from about 350,000 cases a year in 1988, to 74 confirmed in 2015. Since launching its PolioPlus programme in 1985, Rotary has donated $1.5 billion and countless volunteer hours to protect 2.5 billion children in 122 countries from polio. More than 13 million people are able to walk today, who would otherwise have been paralysed from polio. Pope Francis personally vaccinated a child against polio in Mexico last February. While he was Archbishop Jorge Mario Bergoglio of Buenos Aires, Pope Francis was named an honorary member of Rotary - making him the first Pope to accept a Rotary club membership. 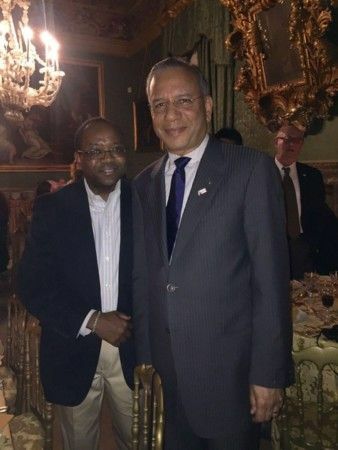 Top: James Phiri (left) with RI President K. R. Ravindran. Bottom: Pope Francis greets RI President K. R. Ravindran.